No exact ETA, but soon. There is one large engine update coming that is rather unique I may say. The BB revamp will come right after. You will know it when you see it. In my experience, and I know this will be pretty controversial, the people who like to use HIPS are also the ones that are best informed about discounts, promos and ways to avoid paying full price. Some of them hop from product to product, depending on where they get the next best, usually completely free, promo on. That's ultimately a behaviour that is going to kill the niche products you love. Or maybe it's the reality of the situation in other parts of the world outside of a bubble? People are always looking for discounts, deals, and quality offerings at a competitive price. It's actually an intelligent way to live life. It doesn't mean being cheap and sacrificing quality for price, it just means being thrifty and discerning. There is also the perception thing where something more expensive can often be (incorrectly) perceived to be a much better thing. But intelligent, discerning people are clever/aware enough to spot situations where the cost vs quality doesn't apply. Most of us in the civilized world know that a Lincoln Car is really just a Ford Fusion in disguise with a large added price tag and a few more pieces of plastic bolted on. I respect Emsisoft for their privacy, decentralized development and responsive/effective team. But I don't think it's worth the price or offers protection above and beyond to justify the price. Those reasons aren't enough to get my wallet open but if Emsisoft did offer something unique and strong I would open my wallet immediately. Or maybe it's the reality of the situation in other parts of the world outside of a bubble? People are always looking for discounts, deals, and quality offerings at a competitive price. It's actually an intelligent way to live life. It doesn't mean being cheap and sacrificing quality for price, it just means being thrifty and discerning. You are absolutely right and what you say is completely reasonable from a consumer point of view and if HIPS were a general purpose software with a big potential customer base, everything would be great. But it isn't. It's highly specialised. A single senior developer salary will easily end up being 6 figures a year. So even if you find 1000 people willing to pay for it (good luck with that, talking from experience), they would at the very least have to be willing to part with 100 USD every single year to pay just for a single developer. And that doesn't even include supporting staff, infrastructure or the fact that a single developer is most likely not enough. That's a fiscal reality, no matter what bubble you are in. In other words, 1 year license of EAM costs more than 3 years license of similar products. I am not a salesperson, but you are comparing vendor prices with those of a price dumping reseller/distributor/wholesaler. If you compare prices, compare prices vendor homepage to vendor homepage or wholesaler to wholesaler. Anything else isn't really comparable. Availability is the key factor here. 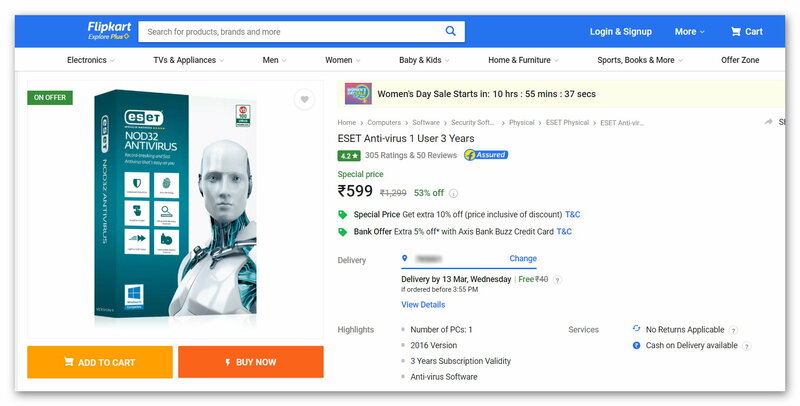 Emsisoft is not available on that online portal(Flipkart). After reading your comment I searched and found that someone was selling EAM licenses over at amazon. But the issue is, the seller has a very few reviews (negative included) and doesn't have that amazon fulfilled tag. Anyways, he's selling a 1 year license of EAM for Rs.850 (including delivery), which is quite a bit cheaper than that of your website but it's still not low enough to compete against the other AVs. 1 year licenses of all the other major products are available in between the price range of Rs.200-Rs.400. Availability is the key factor here. It is available. You can buy directly from Emsisoft knowing full well the license is genuine, and supports Emsisoft. Not some shady bot on Amazon with negative reviews. They...Mike and Tall Emu...trusted you Emsi. It's "Mike's final (OA) blog post - a personal note"
Or ...where is the truth? There always has to be at least one pessimistic individual that refused to read the reasons on why OA wasn't a feasible product going forward. Thank you for your reply regarding Online Armor, @Fabian Wosar. Availability is the key factor here. Emsisoft is not available on that online portal(Flipkart). 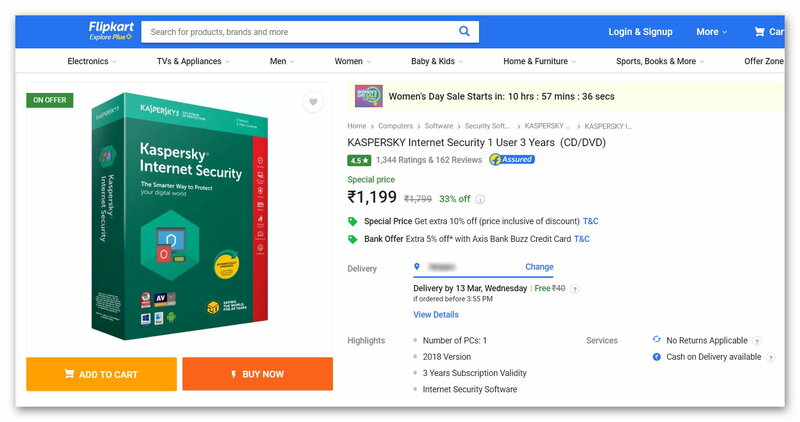 It's ultimately the decision of Flipkart whether or not they want to stock our software though. It's not really something that we can influence. By "It is available." if you meant from their website, then everything is available throughout the world. But if you meant that it's available in amazon but via the unknown seller, then that really doesn't really count. And tbh, regardless of from where we buy the software, it helps the company behind that software. 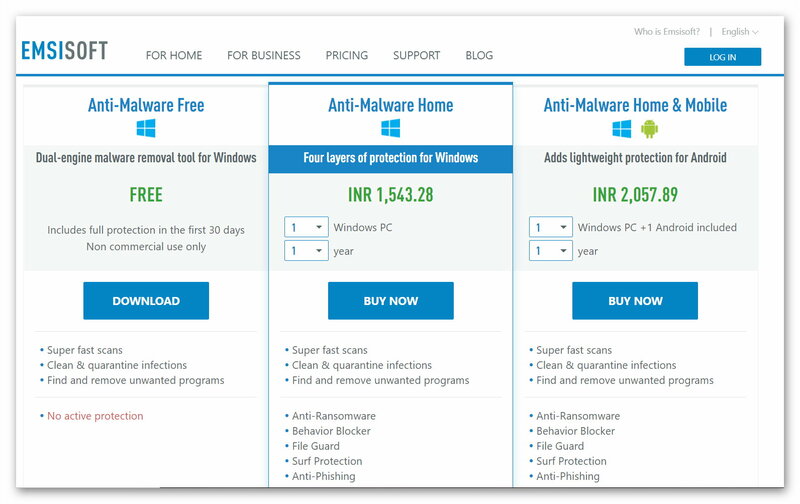 A few days back, I was shopping for an antivirus. I actually considered EAM but the price deterred me from buying it. 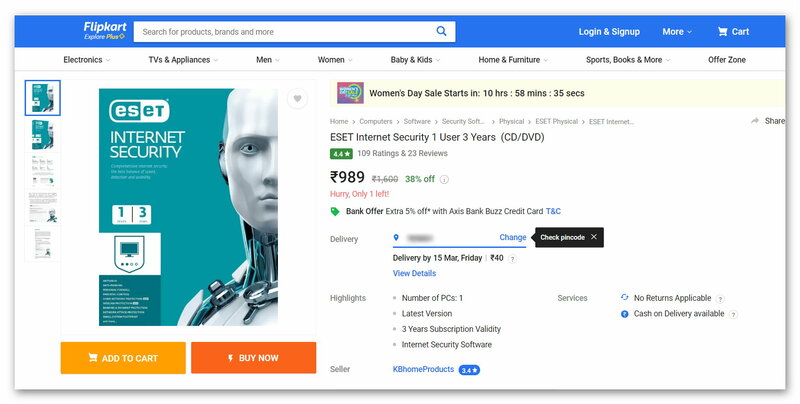 Instead I bought a 3 year license of ESET Internet Security (box pack) for Rs.747. For the price of a 1 year EAM license, I can get 6 years worth of EIS protection. I'm all in for supporting the developers. All of the software that I use (mobile included) are paid for. I've even donated to multiple developers. But if I'm getting a similar product for quite less, I wouldn't be paying a higher price, unless it's not a one of a kind product. I absolutely love Emsisoft. But the price is a big deterrent. And this is one of the major reason why people don't go for Emsisoft in India. I'll give you an idea how much a 1 year license of EAM is worth (If we don't count the unknown amazon seller). That's true. I hope to see Emsisoft products readily available and at similar price range to its competitors, in the near future. India is a huge market and I'm pretty sure that EAM will do great if you guys look into it. I for one, will definitely buy it. In relation to my post in your thread, I've been thinking about pricing and how your competitors can offer them "cheaper" than some other brands. Do you think that since many of these companies have a very large enterprise presence, they are able to off set these costs to consumers? I know Emsisoft does offer an enterprise version, but I often don't see it talked about by IT staff compared to brands like Eset, Symantec, Trend Micro, etc... I am by no means painting a negative picture for Emsisoft, or saying it's garbage or anything. I just mean it as, while I am sure you have enterprise customers, I would hazard to guess it's no where near what some of the other brands may have? Do you feel like since many of these companies have such a large presence in the business/enterprise world ,that the vast majority of their income comes from these customers vs consumers and that is why they are able to offer their products at a more discounted rate? I am sure there are other reasons as well, but am just curious if this is one of the bigger factors? Raiden has a good point. I don't think Emsisoft really has any penetration in the business market. With cloud management, a specialized endpoint client with full cloud-only control, along with an improved BB then it has potential to be a big contender in that market. Especially with their strong privacy and decentralized (and less likely to be interdicted) development it should have some dramatic appeal among businesses and industry. In my experience, they will usually refuse support or responsibility for any purchases that were made through a third party and will direct you to the person you bought the license from for all problems you may or may not encounter. Essentially like OEM versions of software work, cutting out any potential support costs (unless you are willing to pay extra for it). How is either of those two postings in contrast to the fiscal reality that OA back then already struggled to be profitable? I never said OA was a bad product. Just that OA didn't have enough mainstream appeal to pay for its development cost and we heavily subsidized it. There is a reason Mike wanted to sell, to begin with. Following on from the 'ask me any question' thread & me thinking that Emsisoft has still in IMO the best GUI & exclusion system known (still agree) & without doubt I bought a two year license for 3 PC'’s - This was a good decision but, you end up with a subscription, that is reoccurring (I do not want this) – I can cancel on PayPal the recurring subscription as I have but why on earth isn’t a 2 year subscription to Emsisoft a two year subscription. I've logged in but unless I cancel the whole thing in the web system I’m stuffed. This is what winds me up with web based systems – I just want a to two subscription, & please, please give me the option in two years to change my mind, all this system does is pis* me off with bells on – (this subscription can be changed at any time ) Give me the bloody option NOT to engage in it in the first place! If ANYONE @ Emsisoft feels the system that applies a subscription system is a good idea has never visited the planet earth ! This is exactly why I buy from Amazon/Ebay etc where I get what I pay for & why I have issues recommending for example my friends & work colleagues buying from direct sites.I will never do that unless a year means a years or two years means TWO YEARS? After all the price discussion I'd like to point out that where I live ESET AV and EAM have the exact same price for 1 PC for 1 year. Thus the "EAM" is expensive", is not a universal truth. No disputing the local differences here, just something people considering EAM (or any AV software) should keep in mind.